Forming, concrete reinforcement and accessories were provided by Prairie Supply inc.on this large project in Rapid City South Dakota. The Doka light gang forming system was used to great success on this large expansion in Rapid City South Dakota. Concrete contractors, Solid Construction inc. and owner Casey Skyberg had their hands full getting through the tough rocky substrate during the excavation phase of the project, making room for the underground parking. 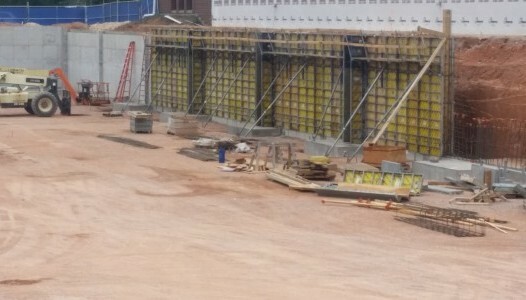 Once through they were able to utilize the light Doka gang forming system provided by Formall and reinforced by a rebar package totaling 135 tons supplied by PRCS. The ease of placing the Doka forms and organized fabricated rebar package allowed for quick set up and movement of the gang forms, keeping this still active project moving to completion.